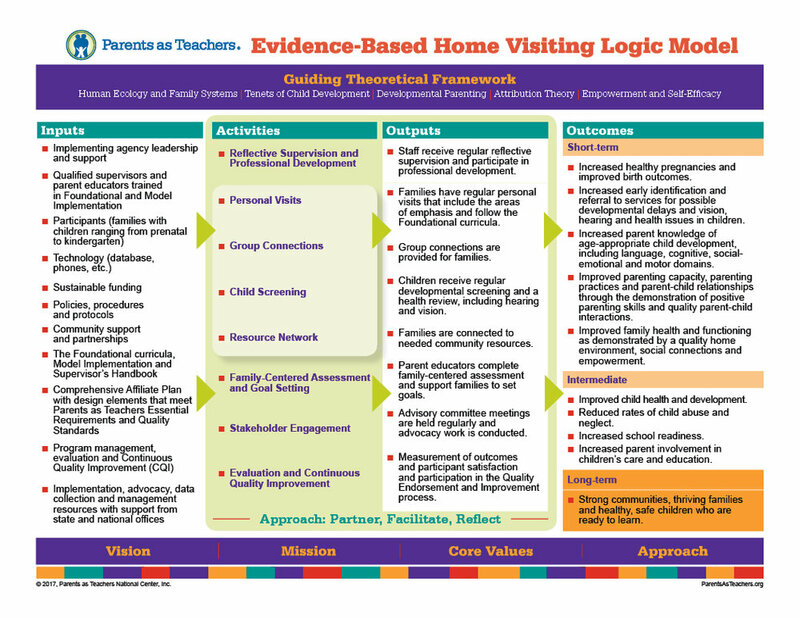 This logic model provides a simplified, visual description of the Parents as Teachers’ theory of change and provides a general picture of how the evidence-based Parents as Teachers model is intended to work to achieve desired outcomes. The logic model represents a sequence of events. It flows from left to right and shows how change occurs over time. Reading the logic model is similar to reading a series of “If…then” statements. Parents as Teachers consists of four dynamic and interrelated components, however additional strategies or model enhancements may be appropriate to best address families’ needs at the local level. For example, implementation may be modified to be culturally responsive, directed to special populations, or offered in conjunction with other early childhood programs as determined by community need. Our logic model offers a visual description of our theory of change and how we achieve our desired outcomes. How can the logic model be used? The logic model provides a conceptual framework that can be used in program planning, training and professional development, allocation of personnel and resources, and evaluation. By demonstrating that activities are not ends unto themselves, parent educators can be increasingly intentional as they work with families to create change and achieve the goals of Parents as Teachers.